Cemetery to NE of Sweetheart Abbey including tombstones and Stewart family enclosure. STEWART FAMILY ENCLOSURE: dated 1856. Rectangular walled enclosure with pedimented gateway bearing Stewart family arms. Light sandstone rubble; roughly squared large stones with smaller pinning stones; red sandstone ashlar dressings. Ashlar coping. Droved quoins. Cast-iron gate. Red sandstone and marble monuments inside. Circa 1960 low-walled extension to N with simpler gravestones. GRAVESTONES: dating from circa 1820 onwards. Representative collection of 19th century and later headstones. Predominantly red sandstone; some marble. Many stones previously limewashed. 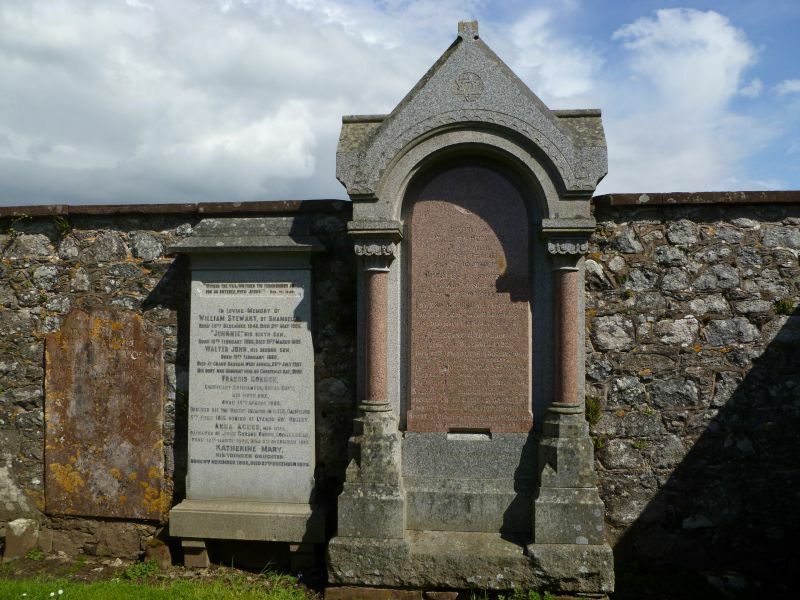 More monumental stones include: George Alexander Nicholson, 1824, scroll-flanked and pedimented; Captain James Murray, 1834, Doric pilasters and urn finial; John Regan Riddell, 1849, obelisk-topped with coat of arms and gothic detailing; James Kingan and family, 1932, decorative pediment and cornice, white plaster with black lettering. Only the cemetery is included in this list. Sweetheart Abbey and the boundary walls of the cemetery are Scheduled Ancient Monuments. The cemetery contains many interesting gravestones. The majority are large upright slabs, but there are a number of crosses, obelisks, large classical stones, and table-shaped tombs. It is interesting to note that the majority of the older stones bear traces of limewash, and a few are still fully limewashed. Before the twentieth century it was common to lime-wash gravestones in order to protect the stone from weathering. The Stewarts were the local landowners, and lived at Shambellie house on the other side of the village.